Our Writer's Festival returned in 2017. Please see below for the terrific activities we participated in during our 2015 festival (a 2017 report is on the way!). 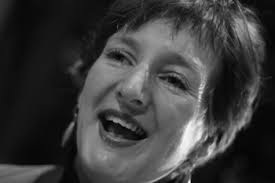 Well known Melbourne story teller, Julie Perrin will be meeting with students throughout Term 2. Her talented work with children in schools across Melbourne will enrich us all. She will be encouraging students in Prep through to Year 2 to share their own stories as she leads classes during three workshops. Two longer presentations will be made to students in Years 3 and 4 as well as 5 and 6. All these wonderful experiences will be interwoven into classroom learning experiences as the school adopts story telling as a whole school focus over term 2. Julie will meet with Prep to Year 2 students on Wednesday 1 May, Thursday 2 May, Wednesday 8 May, Thursday 9 May, Wednesday 15 May and Thursday 16 May. She will be presenting to students in Years 3 to 6 on Tuesday 21 May and Thursday 30 May. On Wednesday 22 May we celebrate the value of books by encouraging over 120,000 children from across Australia to stop and read the same book simultaneously in The National Simultaneous Storytime. Students will be preparing special presentations for a whole school assembly after recess. These presentations will invite listeners further into a creative reading of ‘The Wrong Book’ written by Nick Bland. On Monday 20 May at 2:30 come and either read to a small group of students or have them read to you! In keeping with our theme of telling stories you may even feel confident enough to tell your own story. Consider donating a simple picture book that will be passed onto an Adult Literacy Program the school has connections with. Drop the book in at the office or the Early Year’s building or bring it along with you on the day. Enjoy a muffin, a fun read and contribute to a great cause. 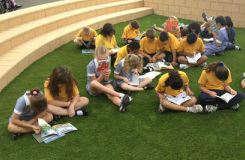 Here’s a chance for students to take a snap of themselves reading a favourite book in their favourite place. Each child can enter the exhibition once and images will be mounted and presented in a unique exhibition around the school. What a very colourful way to remind us that reading happens everywhere! Please return photos with student name and class on back by Friday 17 May. Altough not everyone will participate in this small group of eight students those who do will never read books the same way! A small group of students from Years 3 to 6 will be invited to participate and meet with Clare over three sessions as they share some tips and gain some insights into the illustration of picture books. Application forms will be made available for students who wish to nominate themselves for this priilidged experience. We're all looking forward to what might spring from these creative sessions. One of the most popular days of the year at Pender's Grove is full of guess and lots of laughs! This day is always a fun day to dress up and share with others a favourite book character. Who knows which characters will spring to life on this day as we all rediscover the richness of books. Join us in the morning for a parade of characters. Don’t forget to bring a copy of the book in which your character is found! Students are invited to contribute a piece of writing to a Pender’s Grove 2013 collection of writing. Teachers say there are not many previous year's editions left in our classroom libraries but those which have survived the rigours of flipping fingers are treasured. Everyone will get a chance to enjoy what will be a unique record of our creative community of writers. This year a special online edition will ensure that everyone has access to this unique book. Speak with your teacher to find out more! Please note: Our Writers' Festival will be held again in Term Four 2015. Watch this space for more information!